P.M. Dawn has just released their highly anticipated new single “U,” which is creating a sonic buzz in the worldwide music community. P.M. Dawn is back, with numerous gold records to their name and listed in the top 100 most influential hip hop acts of all time, P.M. 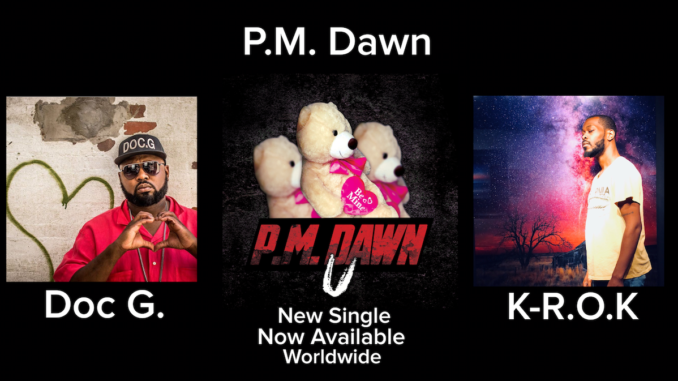 Dawn returns to the music scene with their brand new single which is now available worldwide through all major digital and streaming sites. New Jersey City, New Jersey natives Attrell and Jarrett Cordes, known respectively as Prince Be and primarily DJ Minutemix, formed P.M. Dawn in 1988. During childhood, the brothers lost their father to pneumonia, and their younger brother died as a toddler. The Cordes were raised by their mother and stepfather, Kool & the Gang drummer George Brown, who altered Attrell’s musical outlook, in particular, by introducing him to the mellow work of Donovan. Be and Minutemix made their recorded debut in 1989 with “Ode to a Forgetfull Mind”. The 12″ was issued in the U.S. on Warlock and in the U.K. on Gee Street, which subsequently became the duo’s domestic label following an acquisition by major label Island. The Cordes returned in 1991 with “A Watcher’s Point of View (Don’t ‘Cha Think),” a Top 40 U.K. hit, and then went international with “Set Adrift on Memory Bliss,” built on the oft-sampled breakbeat from the Soul Searchers’ “Ashley’s Roachclip” and multiple elements from Spandau Ballet’s “True.” The wistful ballad topped the Billboard Hot 100 and was a Top Ten pop hit in several other territories, including the U.K. and Canada. It was certified gold the same day as its parent release, the Top 50 hit Of the Heart, Of the Soul and of the Cross: The Utopian Experience, produced in its entirety by the duo. Between albums in 1992, P.M. Dawn scored again with “I’d Die Without You,” an atmospheric piano ballad they contributed to the soundtrack of the romantic comedy Boomerang. Unequivocally an R&B song on which Be showcased his yearning, mellifluous singing voice, “I’d Die Without You” peaked at number three in the U.S. and went gold, helping to make the soundtrack — also home to Boyz II Men’s “End of the Road” and Toni Braxton’s debut single — a multi-platinum success. The Bliss Album…?, P.M. Dawn’s second LP, arrived the following March and debuted at number 30. Highlighted by the George Michael-sampling Top Ten hit “Looking Through Patient Eyes,” the album went gold within three months of its arrival. By the end of the decade, P.M. Dawn had released two more self-produced, doggedly artful, and sprawling albums for Gee Street: Jesus Wept, an October 1995 release, entered the Billboard 200 at number 119 and was followed in October 1998 with Dearest Christian, I’m So Very Sorry for Bringing You Here. Love, Dad. The self-released title F*cked Music followed in December 2000. An extended break ended in 2005, when the Cordes competed with other acts on the television program Hit Me Baby One More Time. Although Prince Be had recently suffered a stroke, P.M. Dawn won their episode with performances of “Set Adrift on Memory Bliss” and Puddle of Mudd’s “Blurry.” Shortly thereafter, Minutemix departed and was replaced by Doc G, one of the Cordes’ cousins. Be’s health eventually declined to a point where he could no longer perform. On June 17, 2016, he died of renal failure. Doc G continued to record and perform as P.M. Dawn, and in 2018 added K-R.O.K , producer of Murs’ “GBKW,” to the lineup.